Who doesn't love a shiny new pole? Woohooo!! Pole dance & fitness has come so far in the last 15 years. It's only natural that our products have evolved to keep up with the demands & fashions emerging in the industry. At X-POLE we have the largest range of fully removable, fully portable, professional-grade poles anywhere in the world. You can now choose to buy a pole in your favorite colour & width, with all the functionality & safety expected from a leading brand. 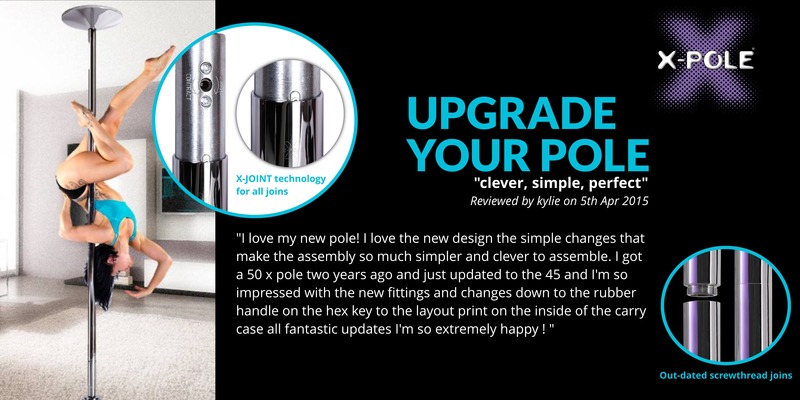 If you've loved your X-POLE for years, or even if it's new but you feel like trying or training on a new finish - our new Trade-in offer is the ideal solution for you. All you need to do is work out which model it is (easy - see here for more info), contact us, we offer you a trade-in discount appropriate for the age, fuction & finish of your set - and you get a new pole (less trade-in discount). Easy! We are working on a 'trade-in / amnesty' for fake sets too.. so watch this space! !